Throw it in a pan, stick it in the oven. Done and done. This recipe kind of couldn’t be easier, and it’s really delicious. It’s also fad-diet friendly! Unless you’re a vegetarian. Then it’s not diet-friendly. Although, vegetarianism is also not really a fad diet, but I digress. 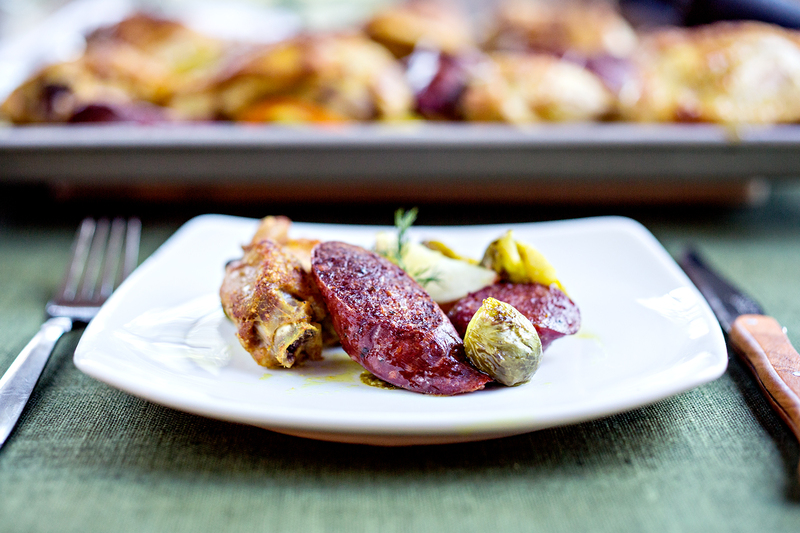 This “one pan recipe” is a great way to use up the rest of last year’s venison sausage but still do something a little different. (Like eat chicken for once, am I right?) And, for some bizarre reason this seems kind of like fancy restaurant food, but really only takes about 30 minutes to throw together from start to finish as long as you’re a fast chopper or have a helper. Great for weeknights when you want something healthy. If you’re watching your fat, use skinless thighs. I wouldn’t swap out breasts, though, because you want the fat to drip down onto the brussels sprouts. For this dish, you basically put your veg on the bottom of the pan. If you hate brussels sprouts, use cauliflower instead. 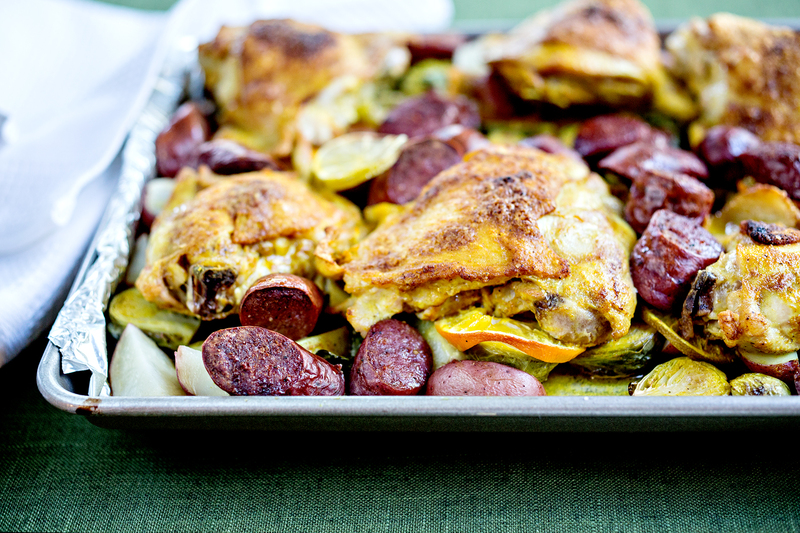 Then you simply top with seasoned chicken thighs and sausage, and all of that fat and flavor melts right down onto your veggies. It really couldn’t be more simple. If you’re not a fan of curry, use a different spice blend. The options are endless! Non-game substitution: Use any sausage! Preheat the oven to 450 F with one rack in the lower 3rd. Also, heat a skillet over medium-high heat. Line a sheet pan with foil and put the brussels sprouts and potatoes in one layer on the sheet pan. Lightly salt and pepper. Top with lemon slices. Sear the skin on the chicken thighs in the hot skillet. Meanwhile, mix the olive oil and the curry. Once the skin on the thighs is crispy, put it on top of the veggies on the tray and spread the oil and curry mixture on each of thigh. Top with lemon slices. Add the sausages in between the thighs. Bake for about 20 minutes, or until a thermometer in the chicken thighs reaches 165 F.